As each bird flaps its wings, it creates an uplift for geese following. 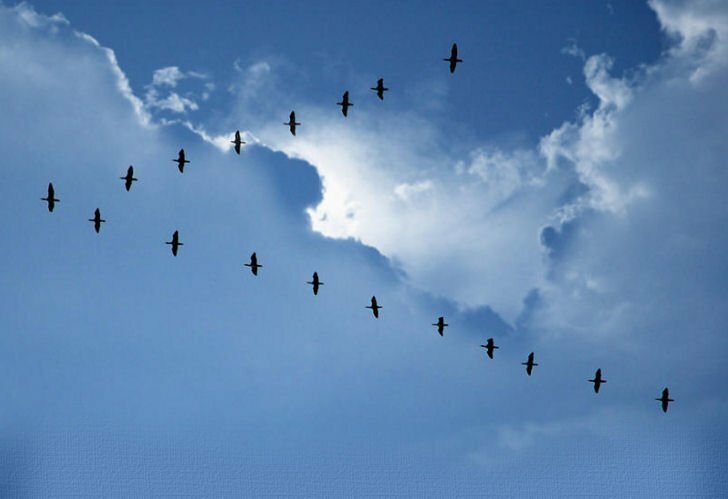 By flying in a "V" formation, the whole flock adds much greater flying range than if each bird flew alone. LESSON: People who share a common direction and sense of community can get where they are going quicker and easier because the are traveling on the thrust of one another. LESSON: We need to make sure our honking is encouraging, and not something else. When the lead goose gets tired, it rotates back into formation and another goose flies at the point position. LESSON: It pays to take turns doing the hard tasks and share leadership. 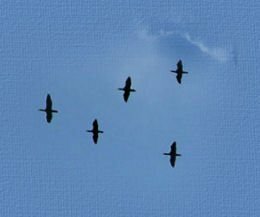 When a goose gets sick or wounded it honks for help and two geese drop out of formation and follow it down to help protect it. They stay with the sick goose until it is able to fly again or it dies. Then they launch out on their own, or with another formation, or catch up with the flock.